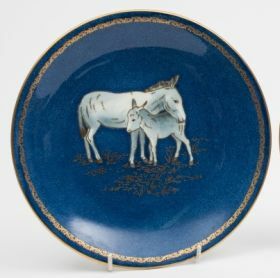 It is probably fair to suggest that as the 20th century progressed in England, domestic porcelain production evolved in response to competition from the Continent and eventually from the Far East and, although a dangerously sweeping statement to make, there was a transition from being a 'volume' manufacturer to one that favoured the 'quality' end of the market. Classic Royal Crown Derby Imari pattern tea ware. Whilst Staffordshire could still boast porcelain manufacturers, the Potteries (as the name suggests) focussed on producing pottery. However, the likes of Minton, Spode and Wedgwood, each with their roots in the 18th century, were still adaptable enough to be producing a wide range of top notch porcelain during the 20th century. 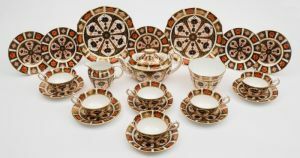 Primarily this was good tableware and tea wares, destined as wedding presents or for high days and holidays, rather than day to day use but did also include plenty of decorative porcelain and some figures, often in attractive limited editions. A 20th century Wedgwood porcelain plate. Elsewhere in the country, other manufactories filling a similar niche included Coalport and Derby, again with a bias towards tableware. They arguably produced a wider range of decorative porcelain and figurines; often rather 'old fashioned' in outlook, but utilising the skills of the best artists and gilders available – the work undertaken by Desire Leroy for Royal Crown Derby being a prime example. See also: Late 19th/20th Century Royal Worcester Porcelain.